Hurricane Irene and the recent East coast earthquake were directed at America's politicians, according to a statement from Michele Bachmann. Bachmann's comments immediately stoked a firestorm of media attention. 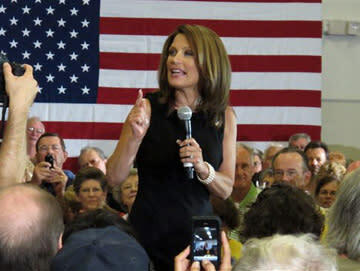 In a follow-up statement, Bachmann's campaign said Monday the candidate's observations were merely a joke, according to Talking Points Memo. "Obviously she was saying it in jest," spokeswoman Alice Stewart told TPM in a statement. Stewart did not immediately respond Monday to The Ticket's request for comment. Bachmann is an evangelical Lutheran who has long stressed her personal relationship with God in public forums. She previously revealed that while serving as a state senator, she asked God for guidance "and just through prayer I knew that I was to introduce the marriage amendment in Minnesota" that defined marriage as between one man and one woman. She also has said that God gave her and her husband visions of marrying one another prior to their first meeting, and that God called her to run for Congress. For some, Bachmann's comment this weekend immediately brought to mind televangelist Pat Robertson, who infamously claimed Hurricane Katrina was God's punishment for legalized abortion.